In April of 1973, I was driving down a dirt road near Grassy, Missouri, headed back to Highway 34 in Bollinger County. Black River Electric Cooperative, my employer, had a branch office in nearby Marble Hill. The day was coming to an end and I was anxious to check in with that office and head back home. I can’t remember exactly what I was doing there. I am sure it was in response to a cooperative member’s request for help with an electrical problem or a billing complaint. Later as I worked in the area I quizzed locals about the grave. No one seemed to know much about it. The story that I eventually heard was that a group of soldiers escorting a wagon with a wounded soldier laying on a bed of straw approached a nearby farm and requested some fresh milk for the wounded man. The farmer caught up a milk cow and extracted some milk for the soldier. He raised up to a sitting position to drink the milk and died a short time later. They buried his body just off the road. For decades only a large rock marked his grave. The grave was still unmarked as a nearby farm family left on a trip to town. As they passed by when they returned that evening they noticed a new white marker was there. Who placed it there? That remains a mystery to this day. 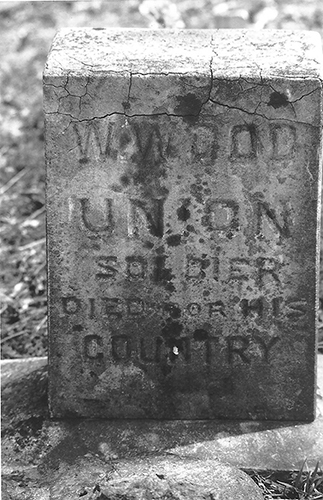 Photo taken at later time shows someone had decorated grave. 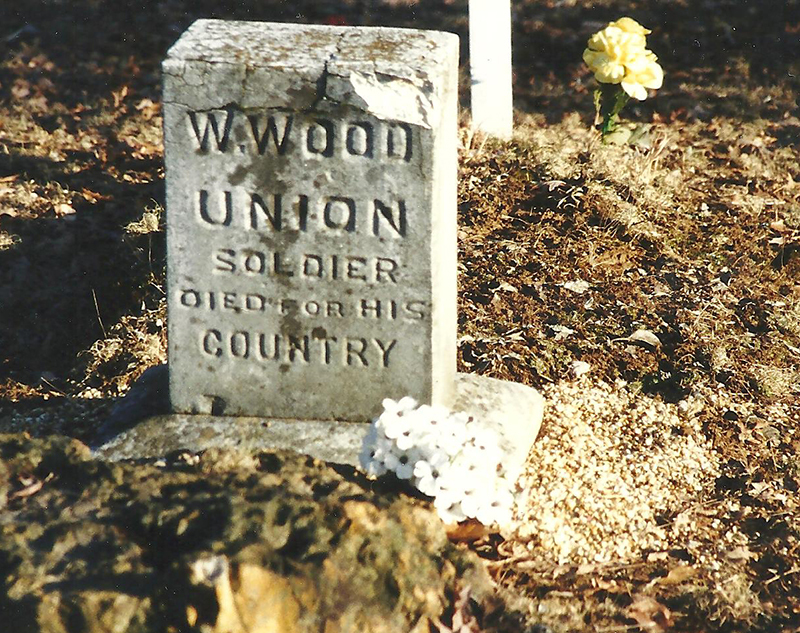 W. Wood was one of nearly six hundred thousand young men that lost their lives in a war with ourselves. Let us solemnly remember the sacrifices of both Union and Confederate forces this Memorial Day. Sundown Trail extends our thanks to Jeanie Layton of the Bollinger County Library at Marble Hill, for additional information. The dirt road near the grave marker is part of the old Military Road that extended from Jackson, Missouri to Greenville, Missouri. The original Greenville is now covered by the upper reaches of Wappapello Lake. Greenville was relocated to just east of 67 highway near the lake. Originally the towns of Marble Hill and Lutesville were separated by a small creek, named Crooked Creek. Marble Hill was the county seat. The two towns existed side by side for over a century. Finally in 1985 they were incorporated together under one name, Marble Hill. The timber industry has always been important to the area. In modern times Lutesville and neighboring Glen Allen were the beginning of a burgeoning shipping pallet industry. The Civil War was particularly savage in Southeast Missouri. Probably it was longer and even more ruthless for both sides than the much publicized Western Border area of Missouri.